Very basic MSX "1" computer. 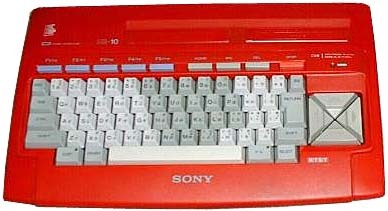 It is the entry-level system of the Sony MSX range. It has got all the minimum features specified by the MSX 1 specifications: 64 KB RAM, two cartridge slots, 70 keys, etc. It has no built-in software applications unlike its brother, the HB-11. These MSX HB-11 computers were sold in Mexico with a Spanish keyboard (also with translated on-computer-printed-info, like the "turn off the computer before inserting or removing a cart" you found near the cart ports) in just one group of stores citywide: a women's clothes boutique called "Superbella". see more Sony Hit-Bit 10 Ebay auctions !